Now in its fourth year, the International Day of Women and Girls in Science recognizes the critical role women and girls play in science and technology communities. Women make up over 50 percent of the population of Africa and form the majority of the work force in most countries. However, women account for only 30 percent of the workforce in STEM fields in sub-Saharan Africa. This number reduces further in leadership positions and graduate levels of education. The presence of women in STEM careers is essential to ensure we can realize the full potential of innovative solutions to Africa’s development issues. Research from different perspectives converge on the idea there is little or no difference in boys’ and girls’ average ability in STEM subjects. In order to attract more girls to study STEM subjects and enter STEM careers, experts suggest we need to encourage young women through mentorship programs, creating an enabling environment and profiling role model women in science. Such initiatives can inspire and encourage young women and girls to become more confident in their capabilities and can serve to empower aspiring and early-career women scientists. Are you a young researcher working in maize-based systems in Africa? 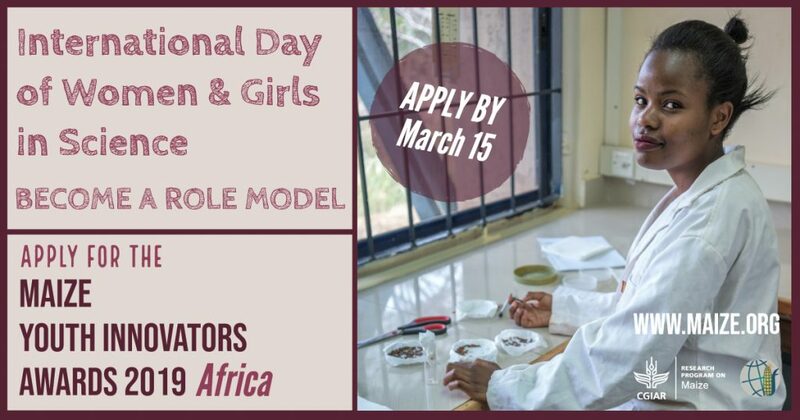 Do you want to serve as a role model or advocate to empower both young women and men to pursue a career in science? Or do you know a young researcher who could fulfil this role? Apply or submit your nomination for the MAIZE Youth Innovators Awards 2019 – Africa.